Public Service Announcement: when it comes to storm surge in south Louisiana, don't Be in the Vee. And don't let the Corps put you into one. Louisiana is still shaking from Isaac's slow hit, and once again, coastal communities have been moved, coastal communities have lost everything, and coastal communities have been coated in industrial waste from neglectful facilities. Unfortunately, there's a lot of confusion around hurricane storm surge in coastal Louisiana. It seems even our Parish leaders misunderstood or misread the standard National Weather Service surge predictions. These predictions were exceeded by the slow-moving nature of Isaac, which gave the winds more time to pile up water into eastern-facing areas. conversely, the slow motion of the storm gave Terrebonne plenty of time to drain, both naturally and via pumps. But regardless of the speed, certain shapes of the landscape can focus surge energies. That's a Vee. A "Vee?" A "Vee," or "funnel" is an informal term hydrologists use to describe how the angles of natural ridges or levees can squeeze water as it moves across the landscape. Water is incompressible. In Louisiana, we use that fact to float on it--even our land floats on it. So when Isaac pushes water against levees, and those levees get closer and closer together, the water has no where to go but up. Here's two sketches to illustrate. You may notice that the surge heights get higher as the levees get narrower. You may also notice how the Orleans and Manchac Landbridges dampen the surge energies across a wider space--the surge is much lower on the west side of highway 90, and west of the west rim of the Lake Pontchartrain. "Vee"s, or surge funnels, illustration by the pre-Isaac surge prediction. Surge gets higher as the water is pressed into narrower spaces. The MRGO funnel is now just a Vee, thanks to the Surge Barrier. 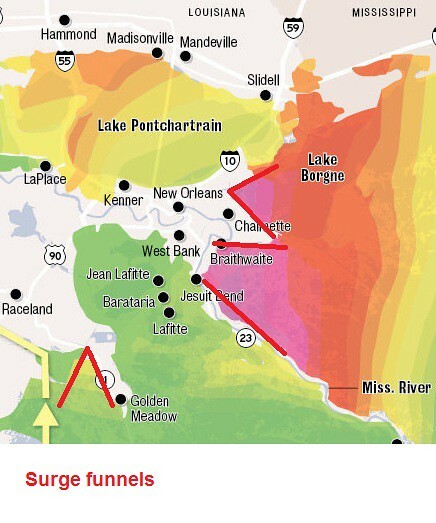 LaPlace surge, focused by the unnatural ridge of Highway 51, and Bonnet Carre Surge focused by the guide levee. You may have heard of the "MRGO funnel." The funnel was a Vee with a rifle barrel attached to it--the east-west portion of the MRGO. Such an alignment of channels and levees was designed perfectly for breaking the New Orleans Inner Harbor levee, and flooding the upper and lower 9th ward. To rectify that situation, the Army Corps had to build a giantic Surge Barrier. Now that this "funnel" is a Vee, this surge barrier took a direct hit in Isaac. The Army Corps has built a giant wall to defy mother nature, and neglected our wetlands as natural protection. New Orleans is safe so long as the operations and maintenance budget holds. The Braithwaite levee was never engineered to take such a hit. And so, it was overtopped by the compressed waters. The IPET report on the failures of the Corps post-Katrina criticised the GNO levee system for being a "system" in name only--it was "designed" one bit at a time. That's how we got a system seemingly designed to be broken at the Ninth Ward levees. There are two useless polders in far New Orleans East, that protect nothing but a former real estate gamble. Because of the levee, the "Six Flags" marsh is perpetually on fire, causing a human health hazard to the City of New Orleans. The Corps and the State, humbled by Katrina, now pay lip service to the "multiple lines of defense" strategy. 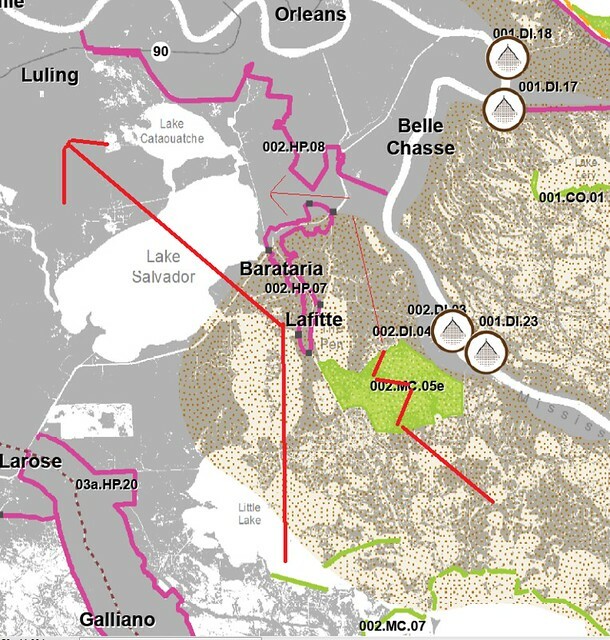 Such a strategy is planned for Lafitte, a historic fishing town built on a small ridge which has lost much of its natural wetland protection to the oil and gas industry. A Multiple Lines of Defense strategy avoids Vees with Ring levees. Like a Judo Master, Lafitte's system will deflect surge around and behind it, into upper barataria, where it has gone since Louisiana existed. Additionally, wetlands are being created and nourished in front of Lafitte (and New Orleans) to slow the storm surge, as the case has been until the 20th century. 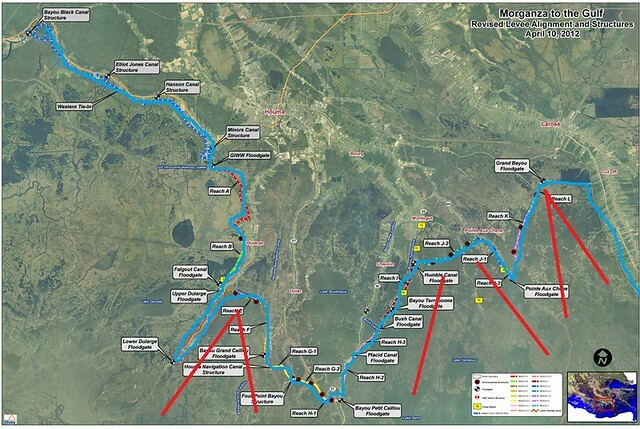 Unfortunately, the favored alignment for the Morganza-to-the-Gulf project is full of Vees! The lessons of Katrina have not been learned. Terrebonne parish merely eyes New Orleans' gigantic, defiant levee system with envy. In deference to politics, rather than natural forces, the current plan to protect Houma involves sticking our chin out to the Gulf and declaring, "come at me!" There is no role for wetlands in the Army Corps' or the State's strategy when it comes to this outlying levee. Current MTTG alignment, with Vees. The lessons of the New Orleans levee failures have not been incorporated into the design. Rather than a lines of defense design, or a holistic design, or ring levees, the federal alignment will be built on sinking parish levees in the middle of water. The system will be expensive and failure-prone. Houma deserves a better protection system. When it comes to levee design, the lessons of Katrina are just starting to sink in. In hindsight, we can see that Braithwaite was vulnerable, and only very lucky during Gustav. To protect LaPlace and Slidell, we can build levees that deflect surge into the wetlands, rather than amplify it. In the future, we should all consider how the angles of the landscape can make a regular surge into a deadly force.